Despite this apparent demonstration of indestructi¬bility, Thakur, quietly, imperceptibly prepared for his departure. More and more often he referred personal, administrative and financial problems to Bor'da. Step by step he moved this son who had served so selflessly so long into the forefront—the preacher organization, the philanthropic activities, the arrangements for food, new homes—gently, steadily he pushed Bor'da into promi¬nence. Each succeeding birthday of Bor'da brought forth exuberant praise, always with a touch of caution that Bor'da demonstrate the same compassion and un¬derstanding that Thakur had. This was culminated one afternoon in the late spring of 1968. When Bor'da came to his father, Thakur said to him, "You sit here on my ted, and I'll go in the back room." "No, No, Father! this is your bed and you stay here !' Borda's protest was immediate, "No, you sit here," Thakur insisted, "Tui to ami. (You are I.) I'll go in the back room, I cannot manage physically any longer." Was it wise and perceptive faith, or a humble yet subtle pride that compelled Bor'da to reject Thakur's proposal ? To this day that bed holds a sad picture of Thakur and the rightness or wrongness of Borda's refusal to sit there still argued back and forth. Thakur's arrangements for his absence were not how¬ever, limited to Bor'da. During this same period, he was quietly advising some people to remain with Kazal and appealing to different workers; "After I've gone, you help Kazala...' Between the frequent trips to Patna to com¬plete his research for his Phd. in Plastic Surgery, Kazal would perform major operations in the small hospital built by Bor'da in consultation with Kazal. During these operations Thakur would send a stream of attendants to inquire about the progress and the success or failure of the surgery. The hospital quickly established a reputation of success and Kazal also demonstrated an awareness of Thakur's expansive spirit. "How much is the charge ?" The monk from the Ramakrishna Mission High School inquired after Kazal had X-rayed, set and plastered the arm of one of the students, broken in a football game. "What charge ?" Kazal queried. "Thakur always says that if things were in proper order, Satsangis could go to the Ramakrishna Mission and feel we were still in Satsang .and you could come to Satsang and feel you are still in the Ramakrishna Mission. So, how can I charge money from members of my own family ?" In 1966, Kazal was married to girl that Thakur had himself chosen from many possibilities and to whom a daughter was born a year later. Kazal's constant trips between Patna and Deoghar. performing operations in both places often gave others the opportunity to observe beneath the apparent simple, unpretentious exterior, was a steel-like tenacity and courage. When a poverty-stricken slum dweller couldn't afford an operation in the hospital, he would gather a make-shift staff, wash clown the shack with disinfectant and proceed to perform hernia, appendix and even a gall bladder operation in the bustees in Patna. Whether it was skill, luck or faith that Thakur would save the patient, Kazal established a reputation among the hospital staff and his poverty-stricken clientele of courage, compassion and success. On Match 16th, 1967, I became aware first-hand of another of Thakur's innocent yet ultimately so meaning¬ful indications of his plans for the future. I had gone to Thakur's room to bid farewell along with Kazal and Chotto Ma before leaving for Patna. Sudhir Choudhury, Janardan Mookerjee, Prafulla Bannerjee and several others were present. It was around 3 : 30 and conversation was going on desultorily. Suddenly, Thakur irrelevantly remarked looking at Kazal, "The astrologers say I'll come back as your son." "Father, please don't say that," Kazal's hands were folded in appeal ''You always remain my father." A few months later and a few days before Kazal would receive his Phd, he along with and old friend were sitting on the verandah of rented house in Rajeadra-nagar, a well-to-do suburb of Patna, where many pro¬fessional people lived. "Kazal," the friend observed, ''did you ever stop to think that with all your experience and degrees, you could start a private practice here in Patna and easily earn 100,000 rupees a year and quickly have a nice car, house and if you made only a couple of free operations a week, you would be overwhelmed with praise: `A worthy son of Thakur...' But going back to Deoghar and the ashram, you'll have to face criticism; blame, slander and you'll always be in financial trouble..."
"I've never given the idea any importance. Do you know why?" Kazal became very serious. "Because Ma used to tell me she prayed to Thakur for me and then, after I came, she prayed to him so she could make a perfect flower to put on the altar of her Lord. I'm not sure just how perfect it is, but I know I can't disappoint her. Even more, Thakur's mission......not just the hospital, or university, but all the people who are searching.....I can't ignore him or them and be happy. So I guess on Wednesday it's back to Deoghar and the slow, stumbling effort to make his dream of a Hospital and Medical College a reality." As the winter slowly gave way to spring, Thakur's physical condition deteriorated rapidly. Big fans replaced the heaters in Thakur's room. In late March, four of us were sitting with him as he smoked his water pipe. He kept looking at Kazal. Abruptly, he put aside the stem of the pipe and child-like with an almost piteous, helpless appeal asked. "If I come as your son and I don't like to read all these messages I've said, you won't beat me will you?" "Father, please don't say this again and again." There were tears in Kazal's eyes. His voice shook with emotion. "You always stay my father." By this time similar com¬ments had been made before many and varied people. It was to become a further step in what has, in retrospect, proven to be a very careful, perceptive and yet so apparen¬tly innocent plan for the near and distant future. By the rainy season, 1968, Kazal was back permanen¬tly and in charge of Thakur's medical treatment. Bor'da was in almost constant attendance except for the few hours he spent at his home dealing with the problems of administration. Bor'da's eldest son, Asoke, now a lawyer and having spent much of his time organizing and inte¬grating the huge Satsang following in Assam was called back to Deoghar by Thakur and requested by his grand¬father to take care of him and assist his father, Bor'da, in his increasing responsibilities, Asoke quickly became for his father what Bor'da was to Thakur. 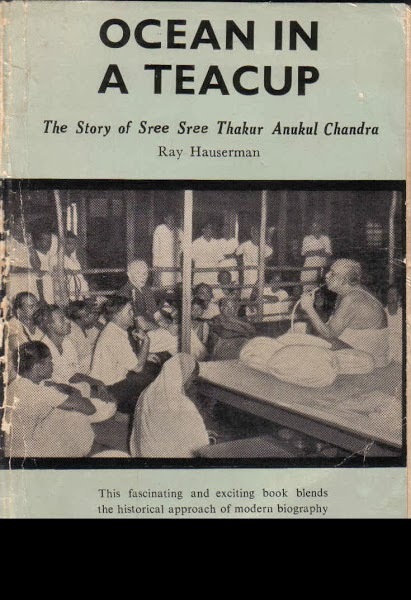 So, from July, 1968, besides Bankim-da, Pyari-da, Noni Da, Bishu, and other experienced devotees who had been with Thakur all their lives, now either Bor'da, Kazal or Asoke were in almost constant attendance. A few months earlier a 1/2 acre plot of land along the western side of Rohini Road between Thakur Bari and Bor'da's house had been acquired. Thakur shrugged off all suggestions to make either a garden, a guest house or a retreat for himself. It overlooked the Darwa River which might someday flow with the Ganges and six miles in the distance was Digheria Hill behind which the sun set each evening and around which Thakur had awakened dreams of a 30,000 acre University City with an astronomy college and observatory on that hill. In October, 1968, Thakur looked out the window of his room, pointed to the oldest building in the yard, the building in which Thakur had first lived on coming to Deoghar and filled with memories and moments of exalta¬tion and love. "Tear it down." Thakui's words were not a query or even a request. For one who refused to pull out an old, decayed tooth because "......it had given so much service......'' or sell a twenty year old jeep for the same reason, this peremptory command left all non-plussed. Thakur would not be denied and within a week the area was levelled to leave a large open area between Thakur and Boro Ma's room. Through the later half or 1968, Thakur would preface each request for some large project with the words, "......whether I live or die......" get the university or hospital. Each such remark would be met by moving appeals from Bor'da, Kazal, other senior disciples "......please don't speak that way, Thakur" with folded hands and tear-filled eyes, his sons by birth and sons by culture appealed and prayed. It is believed that personalities like Thakur cannot ignore such appeals by a devotee. That made it easy: never allow him to be without one. He made that even simpler. For several years he had requested myself and others like me to come and live in Thakuc Bari near him. I had put it off. Several times he had requested Bor'da to live there. He perhaps felt the needs of the administration - made it difficult. He put it off. Often he had requested Kazal to sleep with him at night. Perhaps feeling it was the over exuberance of a loving father. He also delayed doing so. All planned to stay with him. But not just then. Later when it really would be necessary. But for the present we would live in the comfortable surroundings we were accustomed to. How innocently, how simply he exposed us all ! We worked for his causes. We prayed for his health. We appealed to all to grow in devotion ! By now, Thakur could not move without help. Attendants were with him throughout the night. The winter came early in 1968. Heaters were back again. Constantly he would repeat the phrase from Shakespeare : 'There are more things twixt heaven and earth than are dreamt of in your philosophy, Horatio.' and as we'd ponder this he'd add : `But for a nail, a battle was lost….' What were those "thing" ? What was that "nail" ? Sri Prafulla K. Das, who, for over thirty years, had, in close association, recorded the talks and messages of Sri Sri Thakur, and who is the author of a few books on Sri Sri Thakur, including 'An Integral Philosophy of life', came to our Patna house on the 19th of August 1984 and stayed with us for three days, and in course of our talk with him we could gather that as he learnt personally from Revered Yoti Sri Narendra Nath Mitra ( 88 years old), still very much alive at Deoghai' and regularly visiting Bapun Baba (the son of Dr. Kajal), that in his presence Sri Sri Thakur addressing Sri-Ma ( second wife of Sri Sri Thakur ji) had said that when He comes. back as the son of Kajal, she should not beat Him for any reason and more so with her left hand. Neither Sri P. K. Das, nor Yoti Sri Narendra Nath Mitra can certainly be disbelieved for any reason. It is equally important to note in this connection that the two constant attendants and recorders of the day to day talks, and messages of Sri Sri Thakur for years together were Sri P. K. Das, M.A., and Sri Devi Prasad Mukherjee M.A, The words spoken out by Sri Sri Thakur in my presence in Nirala Nibesh ( His cottage opposite the other cottage named Parlour ) pointing His finger to Dr. Kajal, also present there, about His return soon as the son of Kajal, were duly recorded by Devi Bhai in his notebook records of the day and also on another occasion and it is still with him, though for some obvious reasons these words of Sri Sri Thakur could not be published in the Ashram journal. The fact is however openly admitted by Devi Bhai to persons interested. We in our Patna house (54 Pataliputra) have been fortunate indeed to receive Sri-Ma ( second wife of Sri Sri Thakur ji- Moderator) on a number of occasions in the life time of Sri Sri Thakur and also thereafter, and she used to be accompanied by Dr. Kajal, and at times by Dr. Kajil's -wife, daughter and son. In a recent visit to our place on the 16th August, 1983 she stayed with us till the 20th August, 1983 and she made some similar disclosures, the prediction of Sri Sri Thakur made to her long -long back at village Himayetpur in Pabna. It was an exclusive disclosure made to her when Dr. Kajal was still a boy aged 7 or 8 years. During her last visit to our place, she was just recounting a few past events in Sri Sri Thakur's lifetime and since to us these were rather important disclosures made by the mother herself, we with her approval got the conversation recorded on the tape. Her attendant Dabuda ( Bagchi ) was also there. She said that while she was alone with Sri Sri Thakur in His cottage on the banks of the river Padma, at village Himayetpur (in Bangladesh), He spoke to her that He would be coming back and as the son of Kajal. Though rather over-whelmed and feeling sad, she wanted to know how they would be able to know that he himself would be coming back as the son of Kajal and He did disclose to her, that after he was gone, she, in course of her day-to-day morning medita¬tions and while in deep concentration, would hear at proper time, the blowing sounds of conch-shells, thrice on each such occasions and chat would be the indication of his return. India was celebrating the Republic day on the 26th January, 1969, the Fateful day, Sri Sri Thakur appeared happy and jubilant on that particular morning and after the morning prayers were over, He was in a very cheerful mood as noticed by many of the devotees present there at the time. He thereafter had His usual bath and on His own asking for a new Dhoti, put it on, had His usual lunch in time, and then had his usual smoke with the hubble-bubble (water pipe) and then a short nap. He appeared cheerful also in the afternoon, had His usual conversations with His disciples and attendants and at the usual time, had His night light meal (liquid protein) and occa¬sional smokes from the water pipe all in His Parlour. brother, had by coincidence come to the Ashram in that particular month of January and she used to have her bed inside the Parlour at the side end, while the attendants used to have their separate beds on the other side of the Parlour. A blue dim light used to be on inside the Parlour for the whole-night to enable the attendants to keep occasional watch on Sri Sri Thakur and to attend to His particular needs at any time; Sri Sri Thakur had some fits of cough and disturbed sleep and after some tranquiliser was given. He had a smoke and then seemed to have fallen asleep near about 4 A.M. when it was-still dark. Sri Sri Thakur suffered repeated fits of cough. Dr. Kajal came out from his room close by and gave an injection. Peary da and other attendants present there could see that shortly thereafter at 4-55 A.M. Sri Sri Thakur had quietly slipped out. of His mortal frame. He was not breathing. Dr. Kajal wanted to inject an emergency Medicine that used to be kept ready for use if necessary, the injection was made ready and the needle was inserted where necessary, but it was all in vain. And who could stop Him when He decided to go away ? He was gone and to His blessed lard after 80 years of stay on this earth, engulfing lakhs of His disciples and devotees in an overwhelming grief on 27-1-1969. Amidst unbearable grief and sorrow, His mortal frame was consumed in Sandal-wood flames on that very evening, amidst thousands of His devotees and towns¬men, but so many lakhs of His devotees living in distant places were all deprived of a last glimpse at their Beloved Lord the Supreme Father who had been their life, light, solace and pro¬tector, for such a long length of time on this strife ridden earth. Many who had been kept ignorant of His reassuring prediction of reappearance as the son of Dr. Kajal felt much more miserable then those who were in the know of it, but still the very idea that we shall no longer see that glowing, smiling Lord with lotus eyes constantly showering bliss, hope and courage to so many, made us feel almost crushed. Though we know that this sun never sets, that He is all the time with us, may not be physically, but nevertheless was showing Himself up to some of His blessed devotees, either in vision or in dream, and it was a great relief when His prediction of His rebirth got fulfilled.